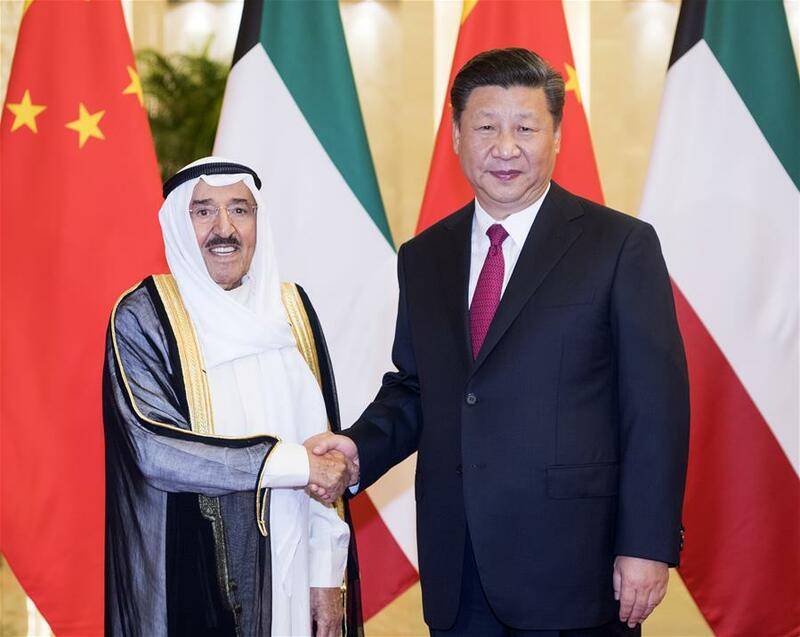 President Xi Jinping on Monday held talks with Kuwaiti Emir Sheikh Sabah Al-Ahmad Al-Jaber Al-Sabah at the Great Hall of the People, and both agreed to establish a strategic partnership between the two countries to inject new impetus into bilateral ties and open up new prospects in the new era. Welcoming the emir's seventh visit to China, Xi expressed appreciation for the important contribution Al-Sabah has made to China-Kuwait ties. Calling China and Kuwait "tried and true friends," Xi said the two countries have always treated each other equally and with sincerity since they forged diplomatic ties 47 years ago. The depth and width of pragmatic cooperation have been extended and brought benefits to the two peoples, he said. The world is in a crucial period during which major reforms and adjustments have taken place, said Xi, adding that the aim of China's proposal of building a community with a shared future for humanity is to increase common interests via cooperation and promote world peace via reconciliation so as to realize win-win cooperation and development among all countries. China views Kuwait as a key partner to cooperate under the Belt and Road Initiative and maintain regional peace and stability in the Gulf region, said Xi, calling on both sides to deepen political mutual trust and firmly support each other's core interests. China will always support Kuwait in choosing a development path suitable for its national conditions, said Xi. Kuwait was among the first countries to sign an agreement on the Belt and Road Initiative with China. Xi encouraged both countries to enhance alignment of development strategies, expand cooperation in the areas including energy, infrastructural construction, finance, trade, and investment, intensify people-to-people exchanges, and reinforce security and anti-terrorism cooperation. China stands ready to enhance communication and coordination with Kuwait to forge ahead relations between China and the Gulf Cooperation Council (GCC) in a steady way, said Xi. Calling China "a peace-loving country recognized worldwide," Al-Sabah, who is on a state visit to China from Saturday to Tuesday, said Kuwait cherishes its traditional friendship and close cooperation with China. The emir spoke highly of China's upholding of fairness and justice in international affairs, saying Kuwait sees China as a trustworthy friend and partner. He said Kuwait firmly adheres to the one-China policy. Saying that he brought "an unprecedentedly large delegation" to China on this visit, the emir expressed the hope that the two countries will consolidate political, economic, cultural, and security cooperation on the basis of mutual trust in a pragmatic spirit. He said Kuwait is willing to construct the Belt and Road with China so as to promote peace and stability in the Gulf region and the world. After the talks, the two heads of state witnessed the signing of a series of bilateral agreements. The two countries also issued a joint statement on establishing a strategic partnership. According to the joint statement, the two countries will synergize the Belt and Road Initiative with Kuwait Vision 2035 and work to promote the establishment of a China-GCC free trade area at an early date. Prior to the talks, Xi held a welcome ceremony for Al-Sabah at the Great Hall of the People. Al-Sabah will attend the opening ceremony of the eighth ministerial meeting of China-Arab States Cooperation Forum in Beijing to be held on Tuesday.